Who Is Best At Links Golf? One of the underrated factors that influences whether a golfer wins major championships is how their game fits with the specific courses played. Three of the major championships are played at venues that do not resemble the typical week to week courses played across the top professional tours. Augusta National is less penal off the tee than almost any other courses and is set-up to favor aggressive, risk/reward golf. The U.S. Open is often the toughest course set-up played over the course of the year and regularly produces rounds where the pros average +5 or more strokes to par. The Open Championship is played on links courses, testing players to hit shots that they rarely face elsewhere over the season. If your game doesn’t mesh with one of those three type of courses, you’re really looking to the more typical PGA Championship set-up as your best shot to win one. With the Open Championship being played at Royal Troon this week, we have included some data below on how well the field has performed on links courses to try to identify those who either possess the right type of game for links golf or who can adapt best to the different conditions of links golf. We’ve limited our analysis to a tight definition of links golf as played on coastal set-ups in the British Isles and have not included courses in the United States and elsewhere that are better classified as links inspired. All data from 2007 on. In the graph above, golfers with less than 10 links rounds are in the ‘low’ group, between 10 and 39 rounds in the ‘mid’ group, and 40+ in the ‘high’ group. 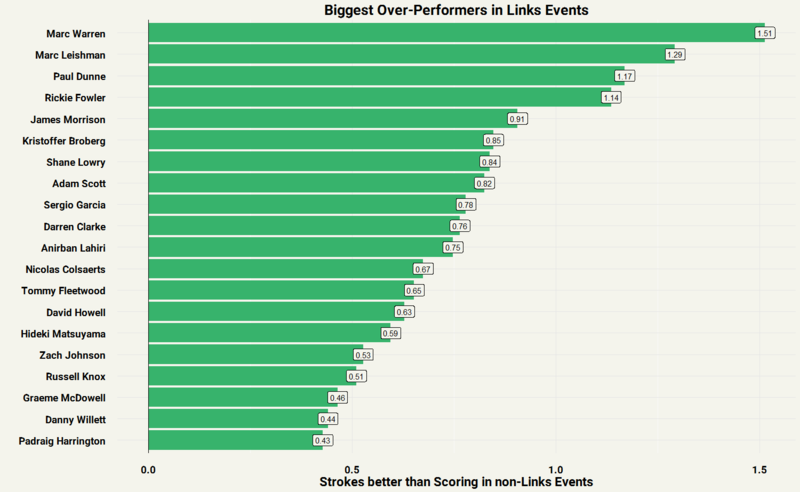 Of those who have played at least 10 links rounds, Adam Scott and Sergio Garcia show-up as the best links golfers in the world. Beating the field by 2.5 strokes per round is about equal to the current “Big 3/Big 4’s” performance over a full-season, so for Scott and Garcia to maintain that level in links rounds over a decade is impressive. Using this approach last year might have helped identify Zach Johnson as someone to watch. Even before winning at the Old Course he would’ve ranked in the fifteen best on the list above at +1.59. Top talents Rory McIlroy, Rickie Fowler, and Jordan Spieth also stand out. Who Has Raised Their Game the Most? As we see most of the top players of the last 5-10 years on the list above, it’s also interesting to see who links golf suits best. 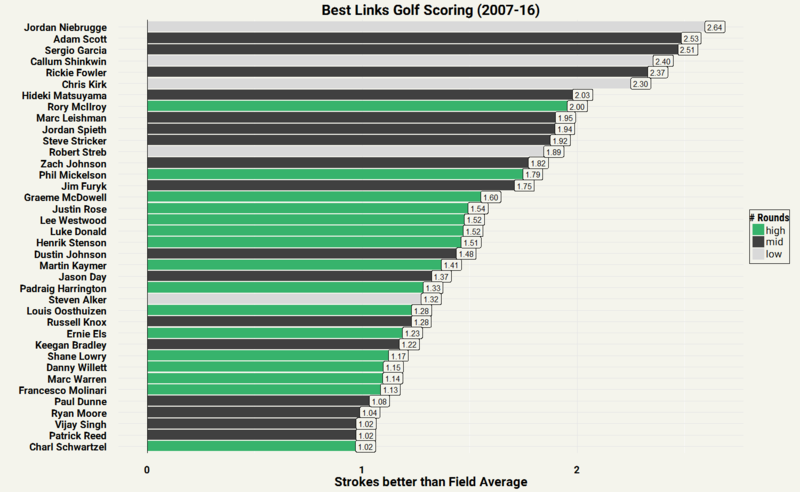 In other words, who raises their game on links courses the most? Now we see a more diverse list of players – not just the major stars. Marc Warren, James Morrison, and David Howell represent steady European Tour winners who have raised their games on links set-ups. Garcia and Scott still appear, but further down the list and comparable to guys like Shane Lowry and Darren Clarke. Looking at these numbers suggest an Open Championship could be the ideal first major for Rickie Fowler and another opportunity for Lowry and Sergio to contend again following last month at Oakmont. Have you any stats on players who have been in the least bunkers? The last two winners at Troon has been in 1 bunker between them.